A variation of my article below was published at Naomi Wolf’s Dailycloudt.com and Britain’s leading liberal magazine, New Internationalist. A complete summary of CY Leung’s inauguration weekend, pro-democracy protests and SAR handover events can be found on my Hong Kong blog. Milton Friedman has long believed Hong Kong to be the model success story of laissez-faire economics. In the eyes of the WTO, the ex-colony’s status as the world’s freest economy is an ideal for the rest of the world to aspire to. In reality, the ‘capital of capitalism’ is anything but non-interventionist and the city today should stand as a warning to libertarians and corporate defenders the world over. Although the territory has seen a huge growth in the number of millionaire residents, the local census Gini Coefficient shows inequality to be at its highest level for 30 years. As it celebrates 15 years of Chinese rule, the UNDP states that the wealthiest 10 percent of the populace control more than a third of the city’s income, whilst the bottom 10 percent share only 2 percent. A meagre minimum hourly wage of US$3.5 was only introduced last May and, with little corporate regulation or competition controls, a small handful of rich tycoons and their conglomerates reign freely. It has resulted in Hong Kong having the worse inequality amongst all OECD members; a fact that should make it a poster-boy for the failures of ‘free trade’. Yet income disparity is only set to worsen as the aging population and low birth rate give rise to an ever-shrinking workforce. Back in the mid-eighties, prompted by this news report, multi-millionaire Bob Geldof organised a global musical event called Live Aid to raise money for the ongoing famine in the Horn of Africa. An accompanying festive single was released entitled “Do They Know It’s Christmas?” in aid of Muslim Ethiopia. The world was transfixed and the crusade raised £150m. However, in 1991, famine scholar Alex de Waal argued that the “humanitarian effort prolonged the war, and with it, human suffering.” Aid was routed via the communist military junta (the Derg), led by Mengistu Haile Mariam, who were also fighting a war in the north – a conflict that part caused the famine. The war was thereby extended by 6 years with Médecins Sans Frontières estimating that the aid may have led to as many deaths as there were lives saved. During the years that followed, reforms changed how aid was distributed in crisis zones and there were also lasting changes in how such tragedies were covered by the news media. The BBC’s Adam Curtis noted how the complexity and grey areas surrounding the use of aid money was underreported. It was a story that did not conform to a simple, good vs. evil cold war narrative. After the equally complex Rwandan genocide in 1994, modern news effectively stopped analysing political struggles and instead reported only on their often bloody outcomes, without context. Bring your own pillow with case (no feathers!). Please take it easy. No swinging at people without pillows or with cameras. Extra points for hilarious costumes. PYJAMAS AT LEAST! Wait until the signal to begin. Please be a good citizen: bring a trash bag & help clean up afterwards! Click here for details and coverage of the 2011 event. I am not the ‘organiser’, everyone is the organiser! I am not responsible for anyone’s safety. 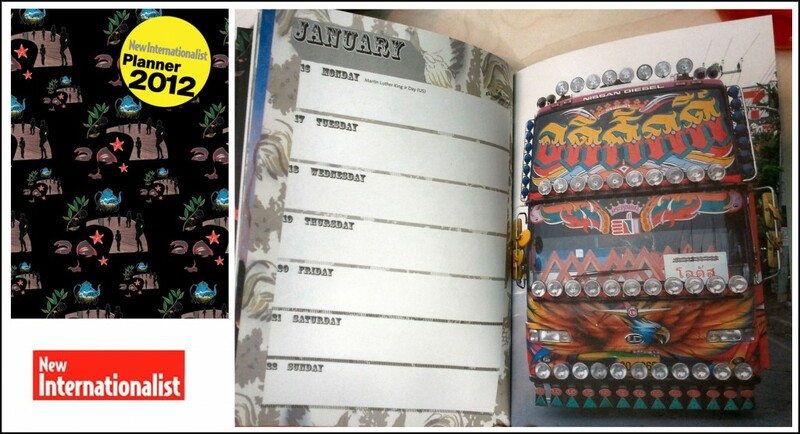 A photograph of mine is featured in the New Internationalist (wiki) 2012 diary planner. NI is a non-profit co-op and is a favourite of mine, focusing on world poverty and inequality.